Cinco de Mayo is this weekend– the 5th of May– a date observed in the United States as a celebration of Mexican heritage and pride. It’s a common misconception that Cinco de Mayo is Mexican Independence Day– it’s not. Mexico’s national Independence Day is celebrated on September 16. 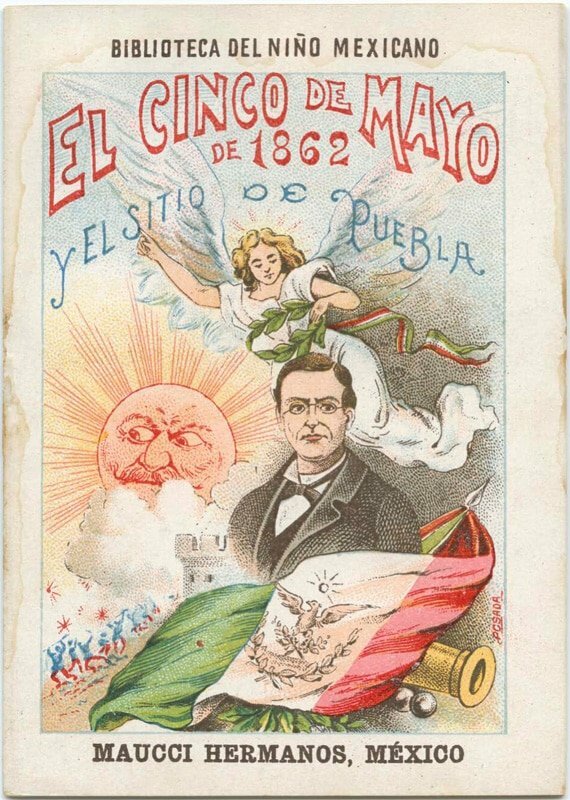 Cinco de Mayo commemorates the Mexican army’s victory over France at the Battle of Puebla on May 5, 1862. Vastly outnumbered and up against the very strong and better-equipped French army, 4,000 Mexican soldiers defeated 8,000 French soldiers at Puebla. It marks the last time in history that a European military force invaded a country in the Americas. The day is celebrated with traditional Mexican festivities– music, dancing, drinking, and eating… lots and lots of eating! With Cinco de Mayo on the horizon, I’m gearing up for a weekend full of Mexican food. Luckily I have one of my best friends to guide me. Sandra is my right-hand girl, one of those friends that has become like family over the years. 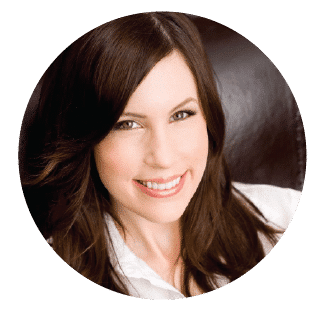 We’ve been through a lot together– her kids are like my nieces and nephews. She is most definitely one of my BFF’s (best friends forever). Sandra was born in Mexico and she’s an awesome cook. Who better to teach me a traditional Mexican recipe for Cinco de Mayo? 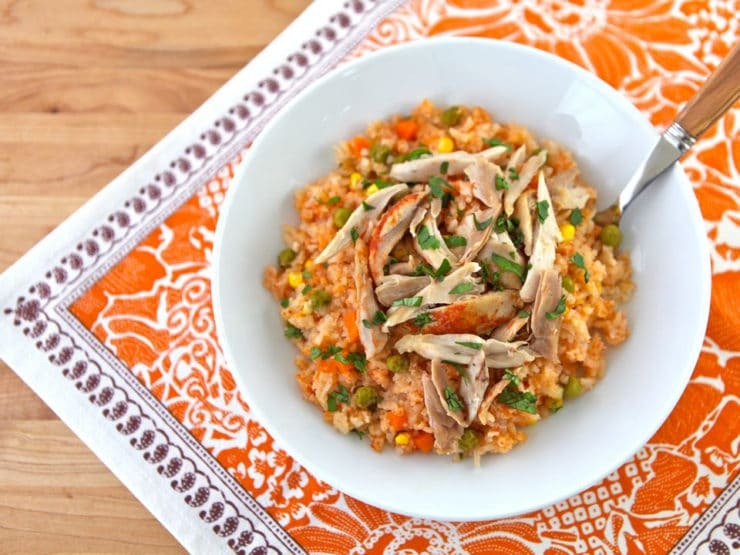 After talking about it for a couple of days, we settled on Arroz con Pollo, a simple, delicious one-pot meal. The recipe produces a wonderful, comforting meal that my whole family enjoyed. It’s easy, healthy, and affordable, too! 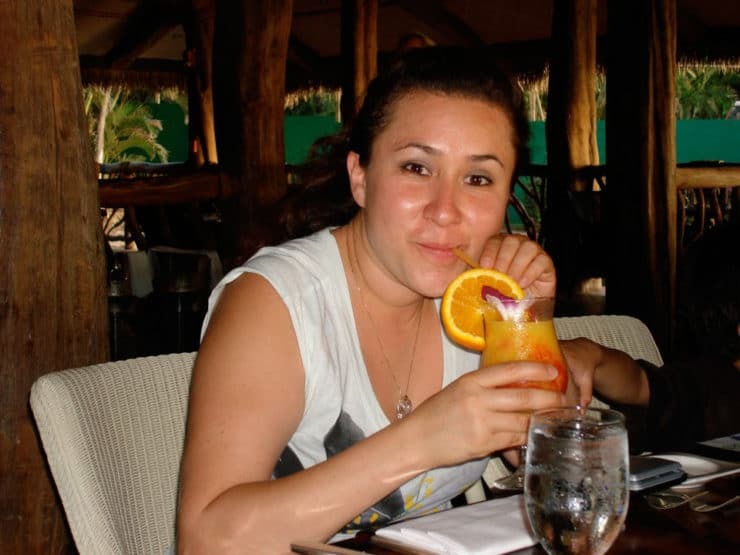 This is one of my favorite pictures of Sandra, sipping a fruity cocktail in Maui. Yeah, my BFF and I went to Hawaii a few years ago. That’s how we roll. Because of the low and fairly slow cooking process, the rice in this dish becomes quite soft. Back in Mexico Sandra’s family sauteed the rice in pork fat. While tasty, it’s not kosher, nor is it particularly healthy. Here she opts for healthier vegetable oil instead (we used grapeseed). 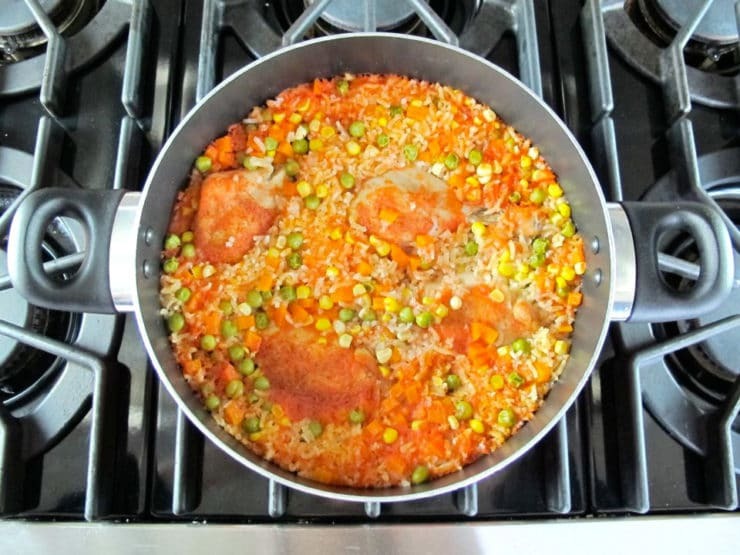 I’m guessing you could use schmaltz (chicken fat) if you wanted something a little more flavorful– and of course, if you’re not kosher, feel free to make it the way her Mexican family would, “con puerco.” Dotted with the sweetness of corn, peas, and carrots, the rice provides a perfect base for tender slow-cooked chicken. This dish doesn’t require a lot of prep work– once everything is in the pot, you can just leave it alone, checking on it a couple of times during cooking to make sure it’s not getting dry. When it’s finished, you’ll have a pot full of soft aromatic rice topped with delicious and tender chicken. Enjoy! Or, as Sandra would say “en Español”… buen provecho! 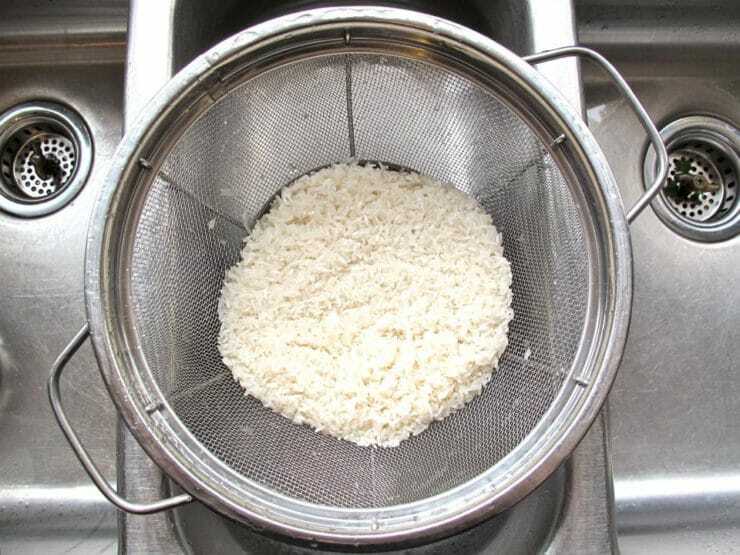 Rinse the rice well in a mesh colander, then shake to drain. Let the rice continue draining over the sink while you blend together the cooking liquid. 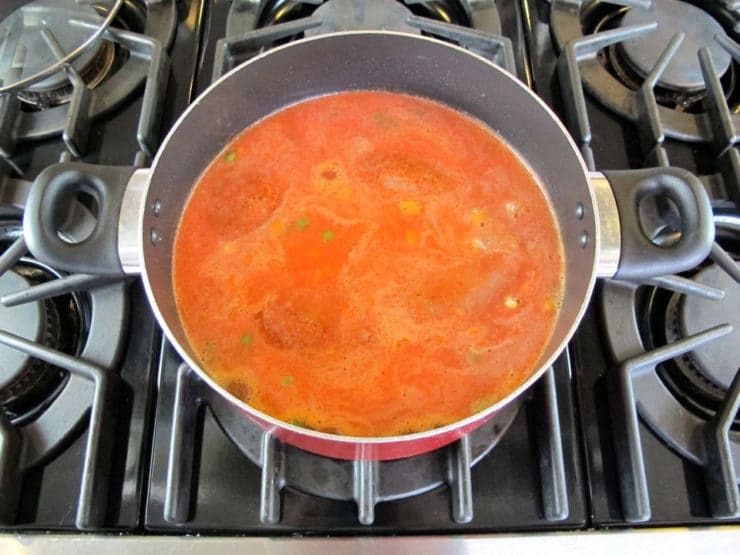 In a blender, combine the roma tomatoes, garlic, onion, and 1 1/2 cups of water. Blend till the mixture is smooth. 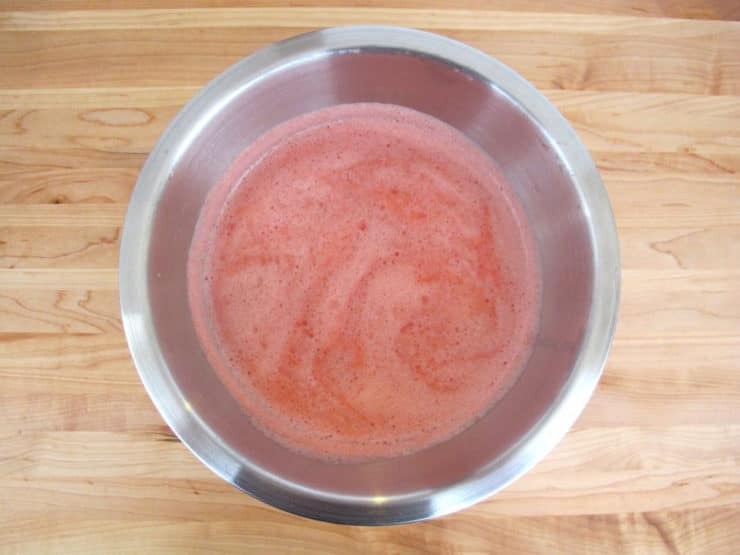 Pour the tomato mixture through another mesh colander or sieve into a large bowl, pushing the solids to extract as much flavored juice as possible. Reserve the juice and discard the solids. Heat up 2 tbsp of oil in a nonstick pot over medium high heat. Add the rice to the pot. Saute the rice, stirring almost constantly, for 10-15 minutes till the grains of rice start to turn golden. Be careful-- when they begin to turn golden, they can easily go to brown/burned if you don't watch them carefully. Measure the reserved tomato liquid into the pot by cupfuls. You will need 6 cups of liquid total. First measure the tomato liquid and pour into the pot (there will be about 3 cups). Once you know how much tomato liquid there is, you can measure out the remaining amount of liquid needed-- in our case, we needed 3 more cups. Add that amount of water to the pot to make 6 cups of liquid total. Stir in the diced carrots, corn, and peas along with 1 tsp of salt. 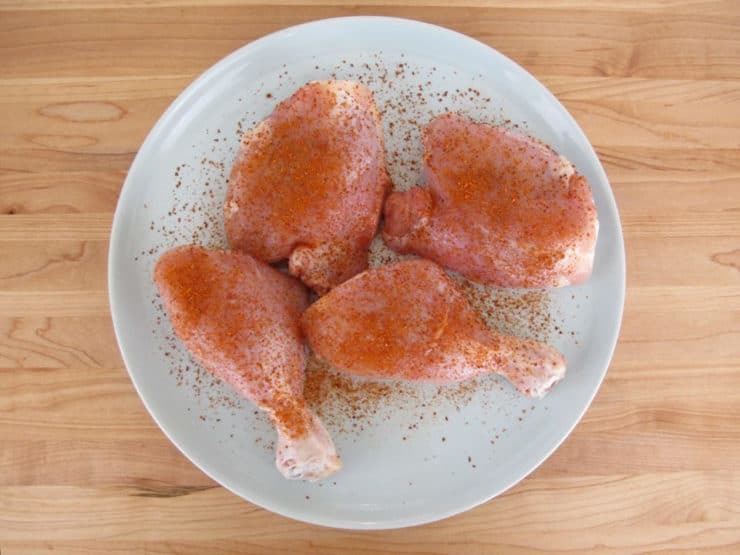 Sprinkle the chicken pieces with salt (skip salting the chicken if you're using kosher meat) and chili powder. You can use up to six pieces of chicken in one pot. We took the skin off of our chicken before cooking to make the dish a bit lighter. You can leave the skin on if you prefer, which will add more flavor to the dish. Place the chicken pieces on top of the rice and vegetables, covered in the tomato liquid. Bring the mixture to a slow boil. 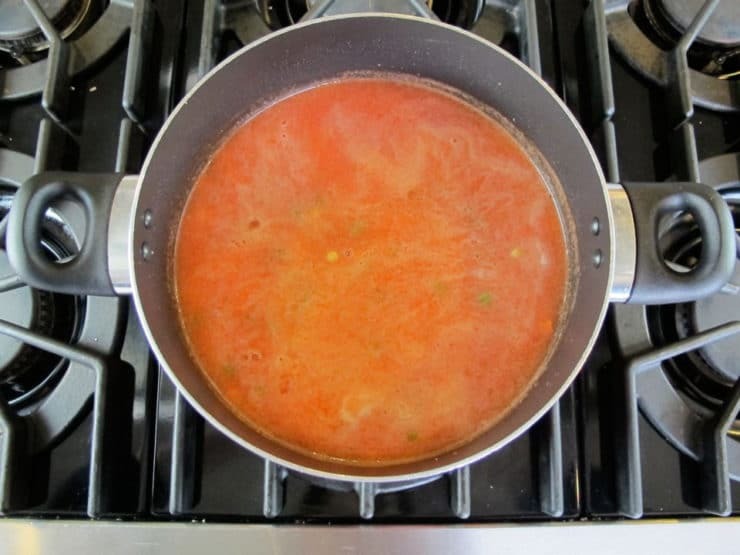 Reduce heat to a slow, even simmer over medium low heat and cover the pot. Let the mixture simmer for 1 hour till all the liquid is absorbed and the rice is tender. Check at 30 minutes to see if the pot looks too dry. Add additional liquid as needed, and additional salt to taste, if desired. We ended up adding another 1 cup of water to the pot after 30 minutes-- the liquid absorbs pretty quickly into the rice. Check the rice again for dryness at 45 minutes. When all of the liquid has absorbed and the rice, vegetables, and chicken are tender, remove from heat. Serve the chicken over the rice, garnished with chopped cilantro if desired. I decided to debone the chicken and cut it into pieces before serving for a prettier presentation. You can serve it on the bone if you like. The rice will be quite soft-- this is the correct texture for this dish. It all comes together in a very warm, cozy, filling one-pot meal. It's simple, homey, healthy Mexican comfort food. Great basic recipe, but it was kind of bland and the rice near the edges of the pot were undercooked. Here’s my suggestions: Season the chicken with salt and pepper and sear in the oil until well browned. Remove chicken, then add ONE cup of rice and brown as directed. 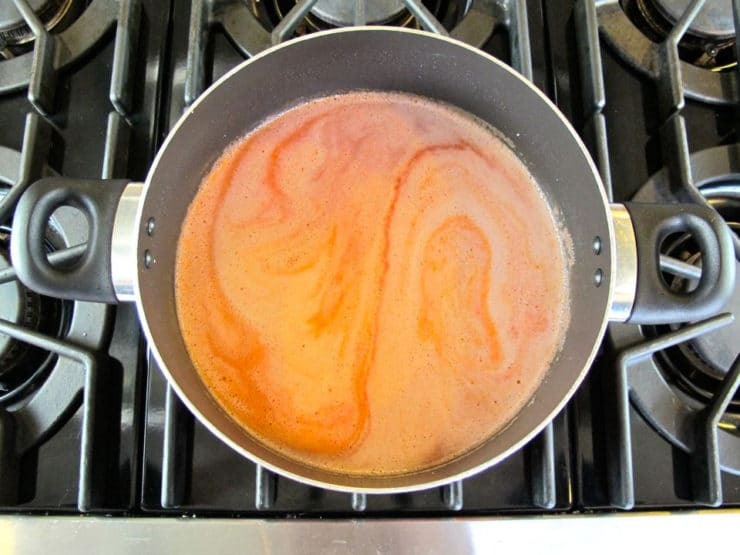 Add all of the tomato mixture (at least 3 cups) along with one tablespoon of chili powder, 1/2 teaspoon cumin and 2 teaspoons salt. Add chicken and veggies etc…Delicious! 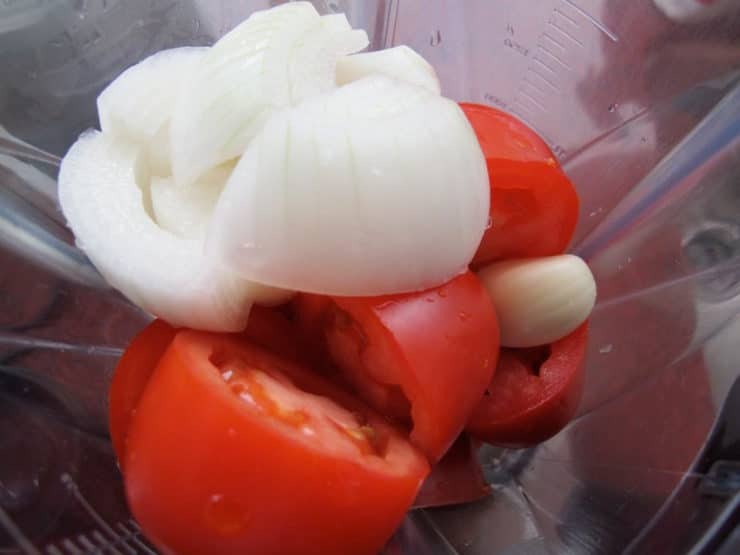 Do you have to discard the solids from blending the tomatoes, garlic, and onion? It seems wasteful and a loss of nutrients and flavor/texture. Couldn’t you add it to the veges and rice mixture before adding the chicken pieces? For traditional texture on this dish you should strain those ingredients. The skin from the tomatoes in particular can make the texture unpleasant. 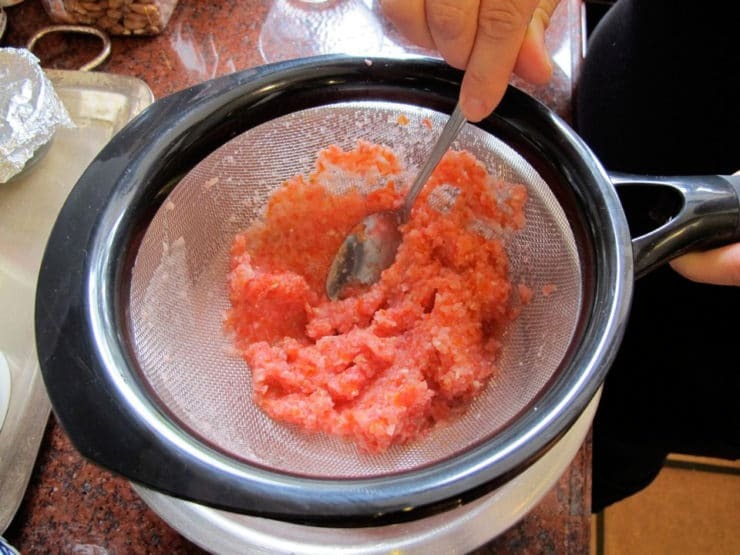 The blended juice also absorbs into the rice better as a liquid than it would keeping those vegetables solid. If that doesn’t bother you, then of course feel free to incorporate the vegetables. This looks delicious! I’m making this for Thanksgiving! Can you use brown rice instead of white? Hi, Tori’s assistant Ashley here! Sorry for the late response. If you prefer to use brown rice in this recipe I’d say go right ahead! I like to brown my chicken first. This is a great recipe. I also have a secret flavor ingredient: Saffron. Everyone asks for my secret. Looks delicious! Could this be finished in the oven and at what temperature rather than the stove top? Covered very well of course. I usually use heavy duty aluminum foil fitted well into and across the top of a casserole pot before fitting on the lid. Thank you for all your yummy recipes Tory. Hi Sheila, I have not tested it this way. If I were to do this I would cook it at 350 degrees F covered, but can’t give you an accurate time estimate without testing it myself. Good luck, and enjoy! Ever thought of using sazon con culantro y achiote and a pinch of cumin instead of chili powder? Thank you so much for posting this, as it reminds me of the Cuban countryside. You gave me a piece of home, and for that, I thank you. We are located here in NC. At our restaurants they serve this with broccoli, mushrooms, and zucchini with a heavy white cheese sauce over all of it. Can you make a suggestion as to what type of cheese sauce to use? Hi Christina, you might try the cheese sauce from this recipe: https://toriavey.com/toris-kitchen/2012/04/roasted-cauliflower-gratin/ but use a white cheese like gouda, gruyere, havarti or jack cheese. Since I haven’t tried the sauce myself I can’t tell you exactly which cheese they used, but all three of those white cheeses will melt nicely using the sauce from the gratin recipe. It may also be a white cheddar cheese. Maybe you can call the restaurant to ask what kind of cheese is used in the sauce? I’ve added you to the list Elsie, thank you for subscribing! Would you happen to have a good recipe for enchiladas?? I’ve tried but my enchilada sauce never comes out so great….. here’s to hoping!! I followed your recipe completely and it turned out so delish, thanks it was quite a hit here at home. Great to hear that Harry! This looks delicious! Can the recipe be doubled or even tripled? I need to feed a crowd! I have never doubled it, but I’m sure it could probably done as long as you have a big enough nonstick pot. Enjoy! Thanks so much for sharing this wonderful recipe! As well as some Mexican history. I did not know that about Cinco de Mayo. I’ll be preparing this for my family tonight. I made ot and the rice got mushy did i do somthing wrong? What causes that? Hi Angelica, you did nothing wrong. The rice in this dish is supposed to be very soft (it says that in the introduction). It’s the traditional way that Sandra grew up eating it in Mexico. It happens because the cooking process is low and slow with lots of liquid. 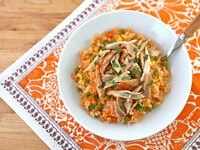 Can I make the arroz con pollo with basmati rice? Hello! Making this recipe tonight. 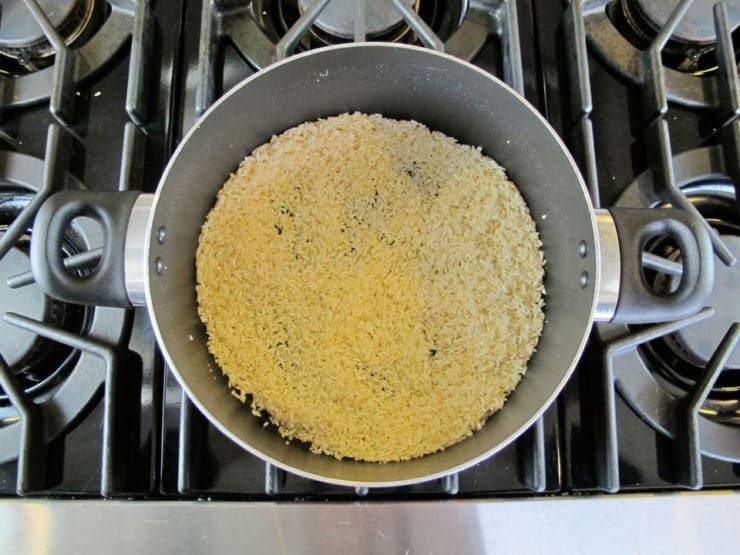 I was wondering if the rice is cooked at the start of the recipe (before it is rinsed,etc). The pictures look like it’s cooked but since it will be absorbing a lot of liquid I wasn’t sure! Thanks! No, the rice cooks in the process of making the recipe. It is only rinsed before starting the cooking process. 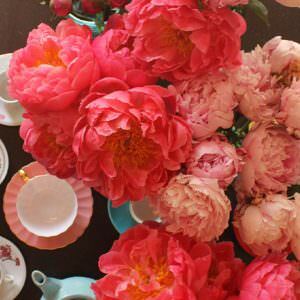 Beautiful color combinations. This looks amazing. Thanks! Looks lovely! Would this dish work with brown rice if more liquid was added? My fiancee who is on the mend post-surgery will love this! She is quite in touch with her Mexican roots. I think this is just the thing to perk her up after a week of recuperation. Many thanks! Thanks, dorothy, for your response. This is the first time I have logged onto a food blogg. my family & my husband’s was in the restaurant and catering business our whole life, so cooking is in my blood. thanks for the comment. Sandy, thanks for the tip, you are right. This would make it tasty by adding flavor to this. I would brown the chicken in a small amout of olive oil after seasoning the chicken in a skillet to increase the amount of flovor instead of just putting raw chicken in the rice pot and then cook through, also deglaze the chicken pan with small amount chicken stock, wine or broth and add to the rice to bump up the flavor. Arroz con pollo reminds me so much of home! 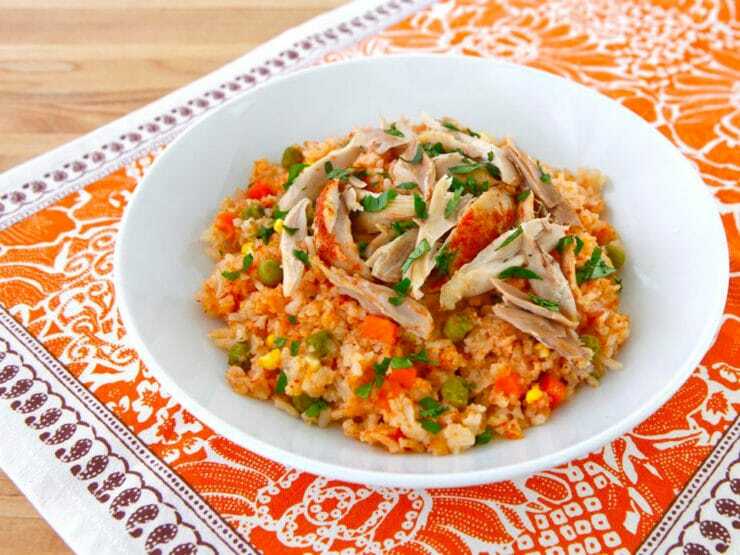 I am from Venezuela and we make arroz con pollo in a lot of different ways there, but this one looks very similar to the one I used to eat all the time, minus the chili powder. It looks wonderful!!! I wanna give it a try sometime!! 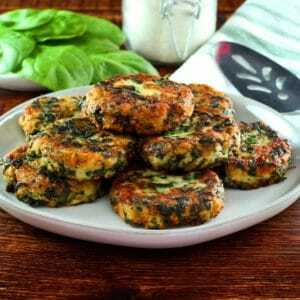 I’m not a fan of dark meat; could you make this with chicken breasts? Would you put them in later? Yes! I asked Sandra and she said she makes it that way sometimes. Just put the whole breasts in at the same time you would put the dark meat chicken in. She said it won’t get dry because it cooks on low in lots of juice. Sometimes she dices it after it’s cooked, or sometimes she cuts it into smaller pieces/shreds (like you see in the picture). If you try it let us know how you like it!